Many people wish for a better life in Christ. You may be surprised to find it is closer than you think. To be honest, just to simply share what gives me a close relationship with Jesus my Lord, is what I am writing this short article about. If I had to look at what made my faith strong this is what I would come up with. Step 1 - The Living Word Many people when they talk about steps to be closer to the Lord speak about having a regular relationship with the Word of God. I don't think it is a matter of how much of the Word of God you know, it's a matter of how much is living inside of you. Any person can quote the verse in Isaiah 53 that says, "By His Stripes you are healed" but a person that has that verse living inside of them is an actual healer that can be used to heal people. We need more than the written Word, we need to have full revelation of the Word and believe in it with all our heart. A good relationship with Jesus comes with real revelation of scriptures in our heart. Only with living Word in our hearts can we fight the enemy. It takes a relationship with the Holy Spirit for the Word to become living within you, and I pray that this might happen for you. Step 2 - A Two way conversational prayer life with Jesus In the parable of the Good Shepherd Jesus says that His sheep know His voice and he speaks to them and they follow Him. It is an important part of your spiritual walk with Jesus to be able to hear Him speak to you. Some people reading this may scoff and think that only a mystic of prophet can hear from Jesus, but the parable of the Good Shepherd says otherwise. Being able to pray and then listen to Jesus as He speaks to you is vital for a close walk with Jesus. Just as the living word is important to your spiritual walk so is a two way speaking relationship with Jesus. 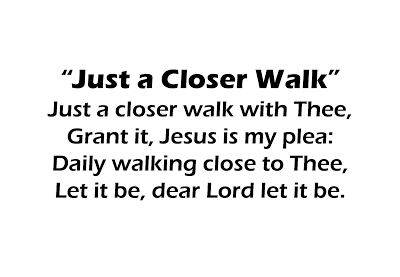 Many people have a great Christian life without speaking to Jesus but we are talking about having a closer walk with Jesus. Step 3 - Obedience When you have a two way conversational relationship with Jesus he will tell you things that He wants you to do. Added to that we have the commands of Jesus that exist in the gospels that we need to obey. You cannot have an abiding relationship with Jesus without obedience. I feel these three steps will bring many people closer to Jesus. We could mention faith, humility, loving your neighbor and other things, but getting these three accomplished will have your relationship improve out of sight.